The Afric was launched on November 16, 1898, delivered February 2, 1899 and made her maiden voyage on February 8, 1899 on the Liverpool to New York run. After her maiden voyage she returned to Harland & Wolff for re-construction. Her tonnage changed to 11,948 GRT. 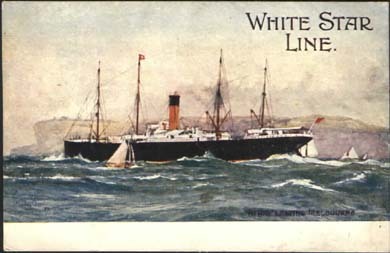 On September 9, 1899 the Afric made her first voyage on the Liverpool to Sydney route. She also carried troops for the Boer War. On February 12, 1917 the Afric was torpedoed 12 nautical miles south west of Eddystone by the German submarine C-66, and sank. 22 dead.